When Ben Bressler launched Natural Habitat Adventures 25 years ago by taking a handful of guests to the Gulf of St. Lawrence, he had a distinct goal: to protect harp seals through ecotourism. If enough money could be generated for northern Canadian communities from visitors coming to see these fuzzy white babies on the ice, then perhaps the incentive to hunt them could be diminished. Hunter numbers are way off this year. It ought to be reason to rejoice. But ironically, the very factor curtailing this year’s hunt – melting ice – is also causing infant seal mortality. The New York Times reports that an exceptionally mild winter has caused most seal hunters to keep their boats moored this spring – there isn’t enough pack ice expanse to hunt upon. Harp seals usually give birth to their pups on large ice floes, which protects them from land-base predators. This season, however, only fragments of ice were left when pupping time arrived. 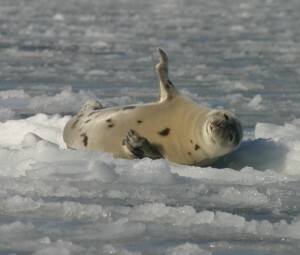 Local residents in Newfoundland and Nova Scotia have seen seal pups floating in to shore on slivers of ice. The large nursery colonies that usually congregate together on the frozen sea have been widely dispersed, making hunting too inefficient to be profitable. 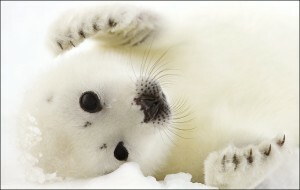 But, as the Times reports, the seal pups have merely escaped one grim fate for another. Many have drowned as they’ve slipped off isolated shards of ice or have floated away from their mothers. Others born on ice-free shorelines have fallen prey to coyotes and bald eagles. Biologists say mortality among the new seal pup population, numbering about 280,000, is expected to be higher than normal, even in the absence of a typical hunting season. It’s hard not to be discouraged at reports like this. It seems inscrutable that harp seal pups, as well as polar bears, are still being hunted for fur and pelts when they face such threats from global warming. Yet those of us who treasure these wild creatures and their unique habitats must not succumb to despair. If anything, news like this is reason to redouble our efforts to protect them. One way to do that is to continue to travel to places where we can see them in the wild, to convince locals and governments that conserving wildlife is important, that it has economic value. Another is to do all we can to educate ourselves about climate change, and how we can respond, both on an individual level, and in terms of public policy. It’s a subject fraught with complexity and political rancor. But all the debate in the world doesn’t negate what we are seeing firsthand in the Arctic. The Poynter Institute’s News University offers a free online course covering all the basics of understanding climate change. It’s geared for journalists, but appropriate for anyone with an interest in studying the topic. In the meantime, I am going to continue to discover as much of our amazing natural world as I can, in the time I have. I hope you will be equally inspired. A quarter-century after its founding, Natural Habitat Adventures offers nature and wildlife adventures on six continents. Explore them all here. The only thing we disagree with in this article is the encouragement to travel to these places to encourage governments to stop it. The boycotting of tourism and products from those countries, especially seafood, is the only thing that will end this.